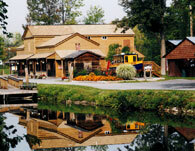 Sims' Museum is a replica of the original Sims' canal store which was located on the Canal about 2 miles east of the present location. The original site was closer to Gere Lock and Belle Isle. There it took advantage of the fact that the boats had to stop there before entering the lock and/or stopping at Belle Isle. The museum is divided into many sections. 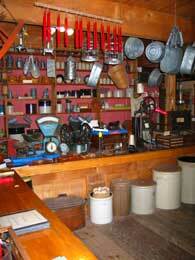 The store section is a replica of the original with many artifacts of the past. There is also a local history section, an Erie Canal Barge display, an 1800's room, and a section describing the building of the canal including some of the tools used. An outstanding wall-mural of a boat traveling over the Nine Mile Creek Aqueduct can be viewed on the second floor.